A Los Angeles Times bestseller: wonderfully lucid and illuminating, Alice LaPlante’s guide to writing fiction “recalls Francine Prose’s bestseller, Reading Like a Writer” (Library Journal). 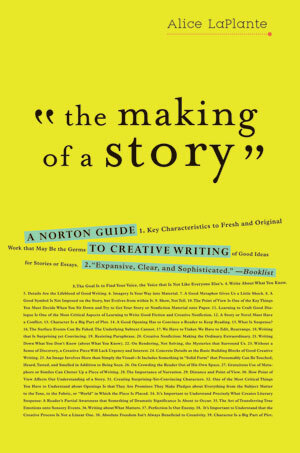 The Making of a Story is a fresh and inspiring guide to the basics of creative writing—both fiction and creative nonfiction. Its hands-on, completely accessible approach walks writers through each stage of the creative process, from the initial triggering idea to the revision of the final manuscript. It is unique in combing the three main aspects of creative writing instruction: process (finding inspiration, getting ideas on the page), craft (specific techniques like characterization), and anthology (learning by reading masters of the form). Succinct, clear definitions of basic terms of fiction are accompanied by examples, including excerpts from masterpieces of short fiction and essays as well as contemporary novels. A special highlight is Alice LaPlante's systematic debunking of many of the so-called rules of creative writing. 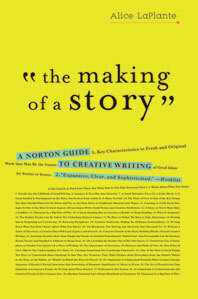 This book is perfect for writers working alone as well as for creative writing classes, both introductory and advanced.